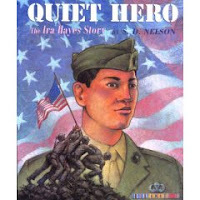 Quiet Hero: The Ira Hayes Story by S.D. Nelson. Copy provided by Lee & Low. Picture Book. The Plot: A picture book biography of Ira Hayes, one of the six marines in the famous photograph of the flag raising at Iwo Jima. The Good: Quiet Hero is about a quiet man, Ira Hayes. Nelson relates how Hayes was always a loner, and how the Marines gave him a sense of belonging. "The men in Ira's battalion became best buddies and Ira finally felt as if he belonged. He was no longer lonely. This was the happiest time of his life." Six of the three men in the famous photograph died during the battle. Because the photo became famous so quickly, the three survivors were sent back to the US for publicity purposes and to celebrate them as heroes. The author explains how this photo wasn't just well known because of the battle and the war; it wasn't just sensationalism; the photo touched people. "They were awestruck. Tears came to the eyes of many. Americans everywhere were filled with gratitude at the sight of these brave young men raising their country's flag in the middle of a terrible battle." The illustrations by Nelson of the battle scenes are terrific; they are infused with red, red for the battle and the heat, the dead and the dying. Hayes was uncomfortable being called a hero; uncomfortable being in the limelight; and lonely once again, now that he was away from the Marines. Isolated and without his support system, he began to drink. There weren't many resources available then for alcoholics, and Hayes died in 1955. He was buried in Arlington. A fabulous author's note is included, with photos, that expands on some of the issues touched on in the text of the book: the Indian boarding schools, discrimination, alcoholism. Parents, teachers and librarians can share this book with children, a book that truthfully and honestly honors someone who would have been a lot happier left alone, and decide how much more of this difficult story to share. A story of a hero dying young is a difficult one; and some people may wonder, why tell it? And why tell it to children? Hayes's alcoholism and death do not take away from his life and his achievements. Whether or not he was comfortable being a hero; he was one. Not just for the photo; the photo is just what happened to highlight this one individuals life. And that life included being proud of being a Pima Indian and volunteering to serve his country, despite discrimination and economic hardships. Those are things to celebrate. The recent movie, Flags of our Fathers, is about the photograph, with Adam Beach as Ira Hayes. Links: The Circle (News and Art from a Native American Perspective) review. Book Moot reviews the John Wayne film made about the photograph; Ira Hayes appeared in it. A Chicken Spaghetti Favorite for 2006.